The roses come and go. We had a short blooming season due to high winds and a heat wave. I'm so grateful for the photos I did take. Four roses, Four note cards. I love joining Vee's Note Card party on the third Wednesday each month. The roses are amazing, Betty. I love the Lagerfeld. Beautiful lavender. With roses as beautiful as these, I certainly hope that they'll be back. (I have a new rosebush waiting in the wings. I dare not plant it with all these frost warnings.) They certainly make a beautiful header, too! That's why it's so wonderful to capture them when we can. So glad you did! Your shots are gorgeous. Tiffany is my favorite. Lovely roses, making nice notecards! I'd love to write a note on one! I do love roses. Yours are gorgeous. 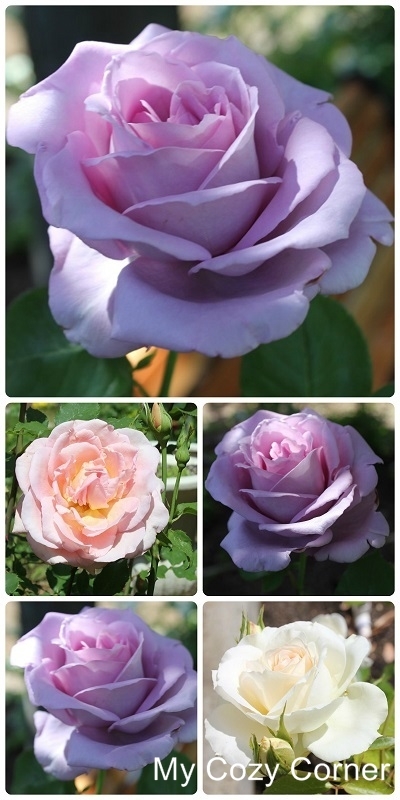 The lavender rose is really spectacular. All of these would make great note cards. Your roses are pretty, I'm glad you photographed them at their peak to share with us. Your roses are gorgeous! I love them all, the lavender one is so unique & beautiful. Beautiful roses! I am partial to white roses and "Eden" is just perfect! So beautiful, Betty. I love that Eden rose. White roses have a mystery about them. But I love roses of any color! All of your photos would make wonderful note cards. Oh how I wish I had the time and discipline to grow roses like that. They are just beautiful! Perfect note cards. I really like the light hitting the petals of the lavender one! I was noticing your banner...what gorgeous roses! I love lavender roses! Super nice for notecards! Beautiful roses! The colors are fabulous! Roses.....they are so pretty and your photos really captures the fine details of these beauties! A lovely set of Note Cards! Your roses are so beautiful! Your photos would make lovely note cards. Roses...I can just smell them. They also remind me of my daughter's recent wedding. Great Note Cards.